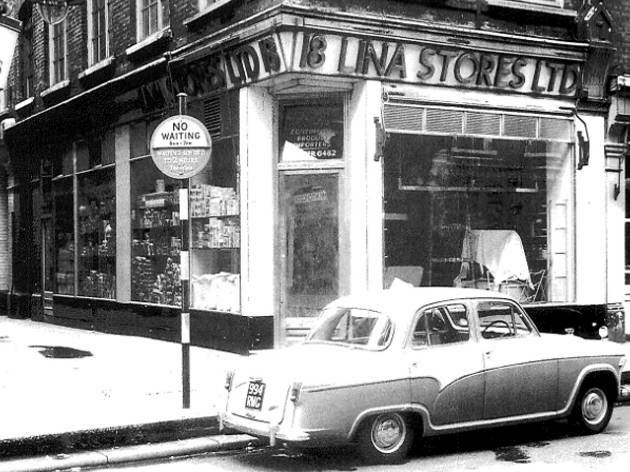 Behind the 1950s green ceramic Soho frontage is Lina Stores, an iconic family-run Italian deli that’s been in business for over half a century. Indeed, Jane Grigson used to buy spaghetti in blue wax paper here years before celebrity chefs coasted the streets on scooters. Besides dried pastas (stored in beautiful wooden crates), there’s a deli counter chock-full of cured meats, hams, salamis, olives, cheeses, marinated artichokes and fresh pastas. Breads are outstanding and filled pastas are some of the best in London; artichoke and truffle or aubergine and scamorza can be recommended highly. 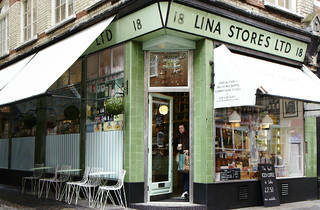 Imported items run from breads to chestnut honey, and Lina is one of the best places to buy truffles in season. They also cater for parties. Been going here for years. Love the redec, but miss the old deli too. amazing Italian produce. Strolling through Soho I noticed this shop with Italian cookies in the window. So of course I walked in. Lina Stores has a huge variation of Italian food. Mostly traditional long lasting products can be found in the shop. Lina Stores also has a homemade pesto, and other traditional sauces, and a wide selection of fresh pasta that was to die for. The flavour quality of their foods is so good that I can’t wait to go back to get some more. They also have a huge selection of cheese and hams. You should see their salamis! 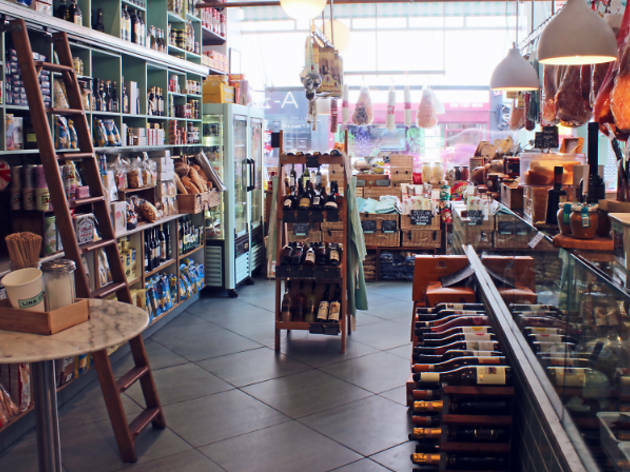 If you’re not a foodie but you’re strolling through Soho, you might want to stop in to get a bottle of wine. Their wine selection is great, sadly I didn’t get to try any because I was too focused on the food. Their logo is this cute light teal and white, making their shop stand out on such a busy street. The sweetest green ceramic-coated Italian store you ever did see, and wouldn't look out of place in Roman Holiday, any romantic Italian novel and/or an ambitious pasta recipe book, with products (and prices) to match. Paper-wrapped spaghetti, handmade tomato sauces, a selection of unpronounceable fresh cheeses and hunks of salami are all de rigour (or whatever that is in Italian). Also, it's both staffed and recommended by loads of Italian people, which probably means something. It's worth checking out the breads but my personal faves are the fabbri cordials, mainly because they come in pretty bottles and only slightly cost an arm and a leg. 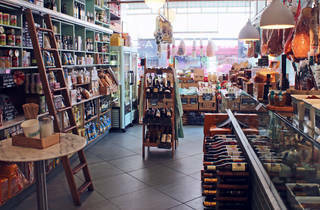 Authentic Italian deli in Soho, oozing with style. Although it feels a bit staged, designed to evoke "la Dolce Vita", it has outstanding products - particularly the fresh filled pasta and the cannoli. Not cheap, as you would expect. 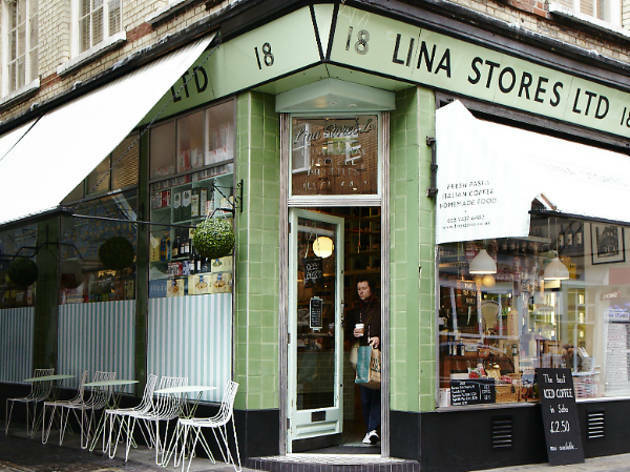 Lina should have more than three stars its definitely my favourite deli in central, great food and cracking coffee to go. Fantastic place! Lovely family feel! Always greeted with a smile and made to feel welcome. Great italian produce too! Definitely recommend this little gem! One of my favourite places in London. It can be a bit of a pain in the arse when it's busy as there's not much room for humans amongst all the pasta, breads, piles of panettone, hanging hams and imported bits and bobs. Time it well though and you can peruse some really lovely produce to your heart's content. Buy a load, take it home and enjoy - it's really very good indeed. They do some cracking sandwiches, too. 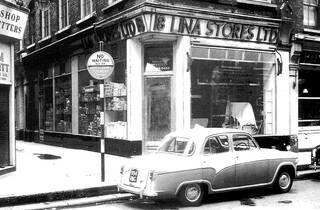 Lina Stores on Brewer St is just how a good Italian deli should be.. it has that great familiar smell of cured meats and strong cheese. They stock all the classic sweet and savoury Italian treats i've loved since i can remember. They also sell a great Italian brand of peach iced-tea which beats Lipton by miles! - Esta The. I used to consider this a great deli for good produce - until today (26/09/2012). The person serving me (young guy, brown hair with a slight curl) served me with complete indifference. I wanted for 150g of pancetta and was asked if 250g was okay (it was the last end bit). It wasn't so asked again for 150g. He then cut off a smaller amount. It wasn't until I got home I realised he gave me the end that was just fat and put the good bit back on display. Rip off and never again.